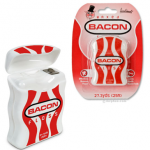 Frighteningly enough, all of these products can be purchased online – click on each image for more info. 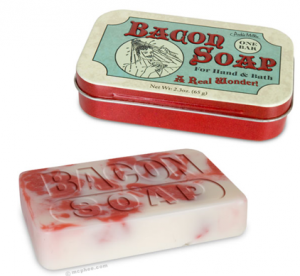 I agree that most people prefer to wash after cooking fried food to remove the smell, but you can always embrace the porky scent and wash with it for all to savour. 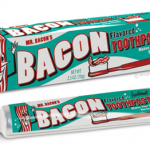 Don’t bother with Fabreze or Airwick! 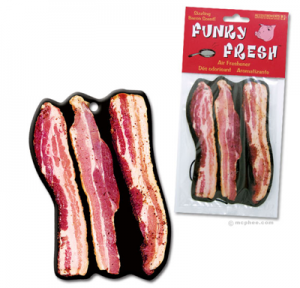 Hang this bacon air freshener by the front door to welcome guests into your farmyard – you might want to buy 2 so you can keep a spare in the bathroom. 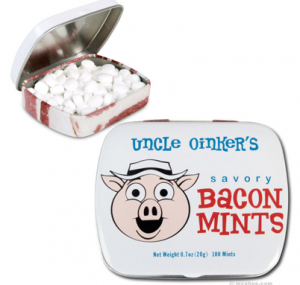 I thought Mints had to be…minty but anyway, freshen your mouth before a date with these ‘pork pills.’ Yum. 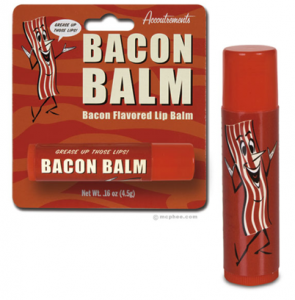 Complete the bacon based mouth ensemble with some lip balm to keep your lips feeling as soft as a pigs bum. 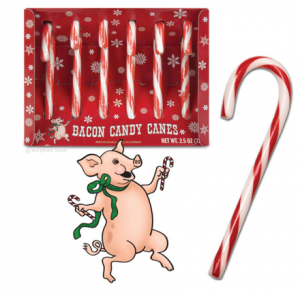 You’ll know that your teeth are in excellent hands during the night once they have been flossed with bacon floss & coated in bacon paste. Night night..sleep well. A timely tribute to Sonya.